The Queensland Government announced last week that a redevelopment for a mixed-use site is being planned for the soon to be vacant Royal Children’s Hospital in Brisbane’s CBD. According to Treasurer Tim Nicholls, the State Government was looking for expressions of interest from the private sector to deliver plans for the development that capitalised on the prime location of the site and to complement the nearby locations of educational and health precincts. "The site – branded the Herston Quarter – is situated on prime real estate and is strategically located adjacent to world-class health and knowledge institutions within the 20 hectare Herston Health Precinct," Mr Nicholls said. According to the urbanalyst.com, developers and investors are being called upon to highlight their experience and talents in planning, managing and delivery of developments, as well as their reuse of heritage-listed buildings. "Revitalising this site will provide new services for families and has the potential to feature residential and hotel accommodation, commercial and retail spaces, medical and complementary health services and new research and education facilities,” Mr Nicholls said. The new Lady Cilento Children’s Hospital officially opens its doors on 29 November and patients of the Royal and Mater Children’s are moving on the same day to the new hospital. 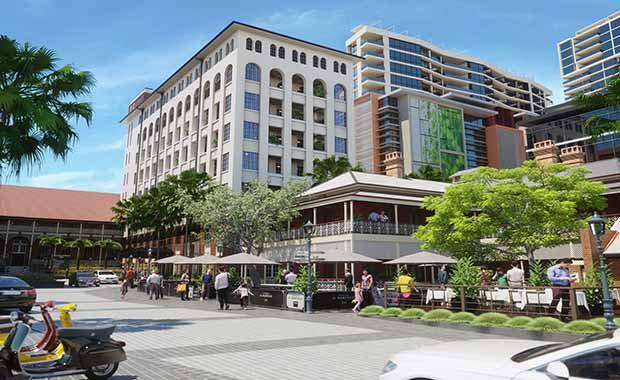 Projects Queensland is responsible for the planning and redevelopment of the former hospital site, with work expected to start in 2016. Expressions of interest close 23 January 2015 and plans that are shortlisted will be given the chance to submit a more detailed plan in later 2015.